I am by nature a very private person, so therefore to write this journal has proved both difficult and cathartic. My journal covers my travels over the past seven years through India, Nepal and Tibet. I have started naturally with my formative years, living in a back to back house in Birmingham, at times tragic, but happy years, knowing the warmth and love from neighbours, my grandparents Archibald and Rachael, and of course my mother, Margery, and as a small boy later to become a Buddhist, photographing the Western reaches of Tibet. I have been asked on numerous occasions, was there a defining moment, an epiphany, when did you become a Buddhist, is it a religion, and why the obsession with monasteries and Tibet?, and each time I have looked puzzled and shrugged my shoulders, and almost apologetic in my reply, "it just happened ?, its not a religion, its a way of life". Its like being asked, why do you eat, because Im hungry. So what were these four noble truths, Trust, non violence, don't cling to gods or possessions, there is no promise of heaven, no threat of hell, above all be kind to all living things. This resonated into the very fibre of my soul, it was like eating, so simple, the food of life, why wouldn't you think like this. So began my quest to chase the Buddha, visiting the crumbling palaces of India, reading of Kings who followed in the Buddha footsteps by relinquishing all wealth and power, viewing ancient Stupas inscribed with his proclamations - the fore runner of the UN declaration of Human rights. All humans are one family, protect animals. Later I photographed the Dalai Lama, I sat under the Bodhi tree at Bodh Guya, visited the Dungeshwari Cave, walked along the shores of Manasarova, climbed to the monasteries in the valley of Ladakh and finally stood gasping for oxygen at the foot of Mount Kailash, confronting my own mortality. So back to the quick fix. India wetted by appetite, so I have added a touch of history to the places I have visited. The simple message of the Buddha touched me, and Tibet was the mystery, it called to my sense of justice. In order to understand Tibet I have laid out bare its unique culture and history and the barbarity of the cultural revolution. This I know makes hard reading but I too have wept and hung my head in shame over the countless human torches that have cried out to us, illuminating the injustice in Tibet, wanting our attention even if its for a fleeting moment. To cry and laugh means that we care, to be silent and look the other way means what, you are complicit, to busy, its not important, its not your problem. Yet by fate, an unseeing hand made me stop and take a long look. Taking a photograph makes you look that little bit longer, nearly dying gives you another opportunity to treasure that look on life again. Writing this journal has made me look at my life and reflect on my fellow man, and yes I have wept tears of laughter and sorrow, Im only human after all. So my fellow reader, I hope you will smile and shed a tear when reading my words. If you do, my heart is yours, welcome to the pond of kindness. I have no memories of my father Harry Wilson. He had volunteered to join The Royal Berkshire Regiment in 1940 by forging his birth certificate. Aged 15, his six foot two inch slender frame complemented the rough pencil mark over his date of birth; altering the Recruit's age from 15 to 16, meant that he was eligible to enlist. So at 15, with a single stroke, he had escaped the slums of Birmingham, left behind his father ( his father, my grand father, another Harry Wilson) and step-mother Rose along with three brothers, all who lived in the real life streets of 'Peaky Blinder' fame, to enlist, and was later shipped out to the Indian / Burmese border to confront the invading Japanese. Following an undistinguished Army career, he was released in July 1947. Arriving back in Birmingham, he resumed his courtship with my mother, and five months later they walked down the aisle on a snowy November morning, her bouquet hiding her five month pregnancy. They left the church in wedded bliss aged twenty two and seventeen. "Did you know that you had an older brother? He died in the accident........ can you pass the sugar?" 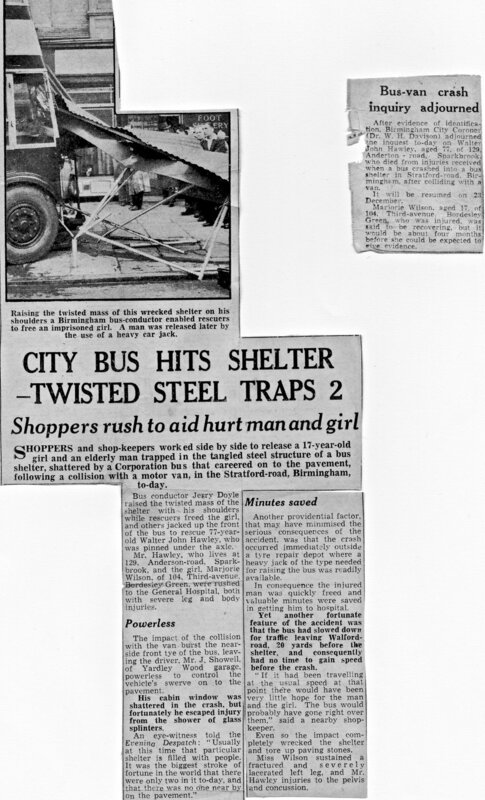 I had lived with the effects of my mother's accident all of my life - what I hadn't known was that when the bus had skidded and crushed the bus shelter Margery was standing in, it set in motion a series of events, that even as I type this, is hard to believe. After being in hospital eleven months, she was discharged from The General Hospital; a year earlier this beautiful bride had lost her unborn child, and with metal plates in her head and leg, she was now an epileptic prone to daily epileptic convulsions. Her compensation, £895. Six years later, Margery aged 24, was pregnant again but this time she was advised to have her pregnancy terminated, as in the doctor's opinion the baby would not live. So, against medical advice she carried on and gave birth to a healthy 8lb baby boy; I had arrived ........... another Harry Wilson. Five months had passed and Margery woke up in bed with her thirty year old husband dead from pneumonia by her side. Alone in the back streets of Birmingham with a baby, and the task of holding down a job in the factory of the BSA (Birmingham Small Arms) and having daily epileptic fits. Living in a back to back house in the slums of Birmingham with my epileptic mother was, as they say, "character forming". As a four year old, I would often leave the house in my pyjamas, walk across the communal yard, knock on our neighbour's door, and ask them to look after me as my mother lay on the floor of the front room convulsing. 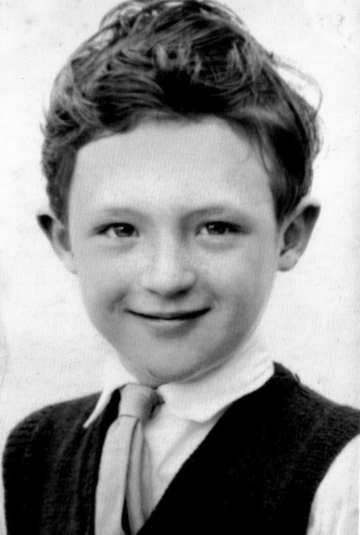 So how did a little lad become the man who on his 57th birthday looked up at Mt Kailash in Western Tibet and pay homage to his Mother? To understand this, you have to appreciate that over the years I have escaped death on several occasions and then was finally confronted by it in a sudden way. At the age of six, I ran home from school, and as I raced out between two parked cars to cross the road, I was hit by a lorry. Not a small lorry, but a brute of a lorry. Spinning like a top, I bounced across the road into the gutter. The driver kindly gave me a lift home - well that's the least he could have done! Margery gave me a rare telling off and offered me and the shaken driver a cup of sweet tea. I think he needed it more than I did, as for me, all that was dented was a six year old's pride. At the ripe old age of thirteen, I was chopping wood and the axe head flew off and landed in my head ......running down the path, with blood gushing down my face, as I stood in front of my mother wanting her to whisk me off in an ambulance with all bells ringing, I was instead calmly handed a cold flannel, a cup of sweet tea, a kiss on the cheek and told to sit down. The moral of this next escape is "don't drink and drive". At the age of twenty one, in the early hours of a Saturday morning, I woke up on my back in the fast lane of a deserted duel carriageway. Now, that in itself is strange because seconds earlier I was in my car driving back to my flat from a nurse's party. At 70 mph I had fallen asleep as the car spun around. Yours truly ( who wasn't wearing a seat belt) was collected by an unseeing hand, taken out of the open drivers door and gently placed onto the road. Amazed, I stood, patted myself down, all intact, no blood, my white suit immaculate, I was perfect My car, a grey mini, my pride and joy, was 200 yards down the road on its side, and it appeared that a bomb had exploded inside it. The engine was in the driver's seat, the front wheel was 50 foot up in a tree, various parts of this cheap yet noble car were scattered over the dual carriageway, and my passenger, my drunken flat mate Nick, was asleep in the passenger's well. Adrenaline does conquer alcohol! As I ran down the road towards the car I thought that Nick must be dead. As I neared the car the passenger's door flew open and Nick appeared, uttering the immortal lines "What the f**k happened?". My first trip to India was in 1997 to Goa. Relaxed, bronzed and proud that I had outlived my grandfather and father, both of whom hadn't lived past thirty five, I had returned home with my wife to our home in Whitbourne. It is important to remember that Whitbourne is a sleepy village in Worcestershire and at least 25 minutes from the nearest hospital. I had been watering the plants in the greenhouse, slipped and my left arm had instantly reached out to break my fall and in doing so had shattered the glass and severed through the underside of my arm. I have no recollection how I had managed to cover the twenty yards from the greenhouse to the kitchen. My only recollection: I found myself sitting upright against the kitchen units, legs outstretched, on the floor in the kitchen, only this time I was far from perfect. As I looked down my left arm was severed in half, blood was spraying everywhere, on the newly decorated kitchen ceiling and walls.The floor was awash with my blood. Sitting there trying to close my arm to stem the flow .....I had no mother to run to, no cold flannel, no cup of tea and a kiss on my ice cold cheek to make it all better, my only thought as I sat there was, "the hospital is 25 minutes away and I have about 10 minutes to live; and this is a really sorry way to die, but at least I made it past thirty five". I was rudely interrupted by Alyson, my wife, who was hysterical, crying and screaming. Why I wasn't hysterical, crying and screaming, still to this day is a mystery to me. I calmly said " I don't care how you do it but dial 999 and get the ambulance here NOW ....I've got ten minutes left then I will pass out". Do I remember my last ten minutes of life, any divine thoughts, regrets, last wishes? Not really - I sat there calm, silent thinking what a stupid way to die. This was one of those moments in life where you should provide an account, a ledger of what you have been, what you have done , and meant to the world, two lovely children were my life's crowning achievement. Their faces faded as I slipped into cold unconsciousness, into my very own warm red lake, as the bells of the ambulance were sounding in my ears. In the next village there was a summer fete and the paramedic crew who were in attendance were on hand, and by fete or fate to save my life. My wish had come true, 25 years later I was being rushed to hospital in my very own ambulance oblivious to its bells and lights. It's true that when you face your death it changes your life, death gives life meaning, you have been given a second chance. Your life that was black and white is now in full technicolour. The sun rising and trees in full bloom are wondrous, Iife was wondrous - I was alive. My life continued. Crashing cars, flying over cars, falling off a roof and, (unlike the movies you don't bounce and shrug it off you cry and ache) - but I was intact. There are defining moments in your life, and over the passing days I saw my dear mother fade, I had no magic flannel, no sweet cup of tea to make it all better. I sat by her bed and gazed into her slate blue eyes, dulled by fear and in that moment we reinforced that bond of a mother to her son, and a son knowing that within days he would lose her. I would be an orphan. 'I knelt at your feet and held you close, your frail arms cradled me, mother to her son and I felt our bond and wept knowing that we would part. Those simple words "I love you" whispered, exchanged, a moment's embrace engraved on my heart. You were strong and I was your baby once again. A moment of time that summed up our fifty years' of love for each other. When you left in the morning, I knelt at your bed and wept, a son for his mother, still thinking of that moment, that memory. Yes my mother my loneliness still lingers and my life will never be the same for I have that memory of that last embrace of love. So farewell my mother, farewell until we embrace again'. In mid 2009, I was dismissed as CEO of a large fitting out company and with my severance pay I now had time on my hands and over the following Christmas I read a travel book by Colin Thubron - To a Mountain in Tibet. "In the hospital wards she calls out for air, I hook the oxygen mask over her face. Her hand comes up to clasp it comforted. When I remove the mask, my mothers hands go on clutching it. It is as if I am taking away her life. In the early hours of the morning she lies in silence. covered by a single white sheet, and her face is young again". So here I was, an ardent supporter of Tibet and their struggle, free from work and what better opportunity and reason to pay tribute to Margery than to emulate this journey to Tibet and Mount Kailash? So on my 57th birthday I stood at the base of Mount Kailash and gazed at it in awe and wonder. Here I was, that little boy 5000 miles away from home ..........I inhaled in panic gasps, nothing remained but this thread of oxygen. Floods of tears ran down my cold cheeks as I tore up my mother's photograph with my eulogy written on the back, and cast the pieces amongst the wind torn bleached prayer flags........I was not alone! My photographs, my ongoing journal "Chasing the Buddha" is my story, my adventure and my second chance.